San Luis Obispo County hospitals have treated five people for rattlesnake bites this year, and treatment is not cheap. It cost about $30,000 a patient to treat rattlesnake bites. Rattlesnake season — when the snakes are not hibernating in their dens — usually starts in March and runs as late as October. Because of an increase in the rodent population, which rattlesnakes eat, there appears to be an increase in rattlesnakes. Of the 7,000 to 8,000 venomous snake bites in the United States each year, on average only five bites are fatal, according to the Centers for Disease Control. 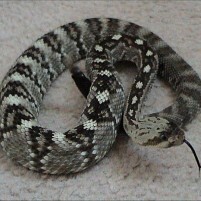 Most snake bite victims recover after a dose of antivenin. Yet another great reason to keep your dog on a leash. Most of us feel snake bit whenever the county gets involved. $5,000 per vial times 4-6 vials (could be as many as 16, depending). Do the math. BTW, $100/vial in Mexico for the very same product made by the same (and only) manufacturer. This is a classic example of what is wrong with out medical plans. Forget the Obama debated or the new plan proposals, the problem is not the doctors it’s the drug dealer, medical institutions and the mob. This translates to: Pharmaceutical Industry, Medical Corporations (Hospital factories) and the Insurance Industry (pay to play). What we really need is the Doc who comes to you house, if needed, his nurse who can set up the I. V. and cash, forget that insurance crap. I appreciate the warning, but what would make this an even better story is reporting WHAT treatment for rattlesnake bites consist of and WHY it costs “about $30,000” per treatment. That would also be very helpful and informative. It cost that much because of economics, politics, policies and profits. If you get bitten in Mexico the price will be far less because the government there considers snake bites a serious public health problem and they buy large quantities of antivenin at much lower prices. Whereas American hospitals individually buy antivenin in small quantities at a huge markup. With my obamacare deductible, the venom will only cost me $12k out of pocket. I will keep hiking! Thank you for the heads up. Keep your eyes open when out in the country.